On November 17, 2015, Toronto audiences saw the North American premiere of Julie by Belgian composer Philippe Boesmans. Incredibly, this was also the North American premiere of any opera by Boesmans, a composer widely celebrated for his operas in Europe. A further remarkable circumstance is that it was not an opera company that brought about this production. Rather Julie is a co-production between a theatre company, Canadian Stage, and Soundstreams, a company specializing in contemporary music. The impetus behind this event is Canadian Stage Artistic Director Matthew Jocelyn, who, before taking up his post in Toronto, led the Atelier du Rhin in Alsace for ten years, establishing it as a major centre for theatre, opera and contemporary dance. His approach to Canadian Stage has been to make it a centre for theatre of all kinds. He has already added musicals and contemporary dance to its offering of plays. Opera is just the logical next step. Jocelyn has known Boesmans since 2001 when the composer wrote music for Jocelyn’s production of Paul Claudel’s L’Annonce faite à Marie. Later while still in France, Jocelyn met Boesmans and asked him to write a chamber version of Julie, which had premiered in in a full orchestral version in 2005. Boesmans did so and Jocelyn toured a production of this version throughout France, Belgium and Switzerland. It is this version for an orchestra of eighteen that Canadian Stage is presenting. The libretto for Julie, written in German by Marie-Louise Bischofberger and its first director Luc Bondy, radically cuts its source play, August Strindberg’s seminal naturalistic drama Miss Julie (1888) down to the bone so that the opera runs for only 75 minutes. Jocelyn presented the opera in the 2007 English translation Anna Herklotz prepared for Music Theatre Wales. As in Strindberg, it is Midsummer’s Eve and the aristocratic Miss Julie leaves her party guests to visit the servants Jean, her father’s valet, and Christine, Jean’s presumed fiancée, below in the kitchen. Julie, despite a fundamental hatred of men, is intent on seducing Jean, who, having loved Julie from childhood, is only too willing. The two consummate their lust off stage, but afterwards Julie sees no way out of her shame but suicide. Those familiar with the play will find several key sections missing. We do not hear of Julie “training” her potential fiancé with a whip. We do not learn of the unusual labour arrangements on her mother’s farm where men did women’s work and women men’s. We do not hear her long lament after Jean slaughters her canary. And we do not hear Julie famous “speech about the train” where she tries to convince Christine (and herself) of the excitement of travel. In the original Jean claims he made up his speech about having loved Julie from childhood just a ploy to seduce her. In the opera, he seems sincere. In some productions of the play, Jean is portrayed as intentionally scheming Julie’s downfall. here he is merely a brute, pleased to enjoy his employer’s daughter if she offers herself but just as willing to discard her later. Jocelyn, set designer Alain Lagarde and costume designer Zaia Koscianski have relocated the action from the 19th century to the present, a move that works surprisingly well. It does mean that Julie’s despair at having lowered herself through her affair with Jean has less to do with class barriers than it does with Julie’s own sense of pride. Lagarde’s set consists of two solid walls left and right with a solid ceiling. The back wall of semitransparent plastic pierced with a solid door gives the impression of a kitchen still under renovation, perhaps a reference to Julie’s father having once burned down the estate. Visually, the most stunning scene is the storm that takes place during Julie and Jean’s love-making, with real water pelting the plastic wall and the upstage right corner of the ceiling finally giving way to let in a downpour of water. Boesmans’ music is very spare much like Benjamin Britten’s The Turn of the Screw but heavily influenced by orchestration and turn of phrase from the Second Viennese School. The opera begins and ends with a muffled drum playing the lub-dup of a heartbeat – Christine’s at the beginning when she goes about her daily tasks, Julie’s at the end as life ebbs from her. The music seems to grow from Christine’s inconsequential humming until it takes form in song. 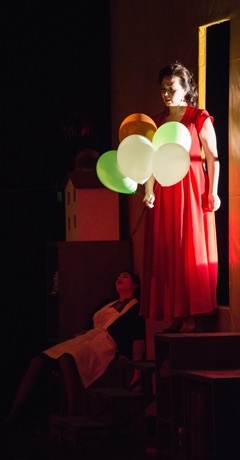 Christine is the only character granted lyrical phrases, while Julie and Jean converse in broken near-atonal utterances with song often giving way to spoken word for emphasis. Most remarkable is Boesmans’ frequent use of musical allusions to enrich the drama. Christine, upon realizing that Jean has slept with Julie, broke into a staccato coloratura passage reminiscent of Mozart’s Queen of the Night to signal that revenge, as in “Der Hölle Rache kocht in meinem Herzen,” was the first thought to occur to her. Significantly, Boesmans had the still-virginal Julie repeat a descending Spanish-style melisma that instantly recalled Bizet’s Carmen. The irony was that Julie may be playing the role of seductress with Jean but is no proud outcast like Carmen and has has none of Carmen’s strength or self-assurance. Indeed, the elegant spareness and careful word-pointing of the orchestra often stand in ironic relation to the confused thoughts and emotions of the characters. This distancing, like Brecht’s use of alienation, deliberately causes us to regard the characters analytically rather than emotionally. she has nothing to live for. 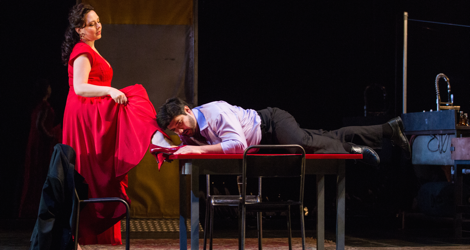 Boesmans’ opera shifts Julie’s crisis from a conflict of class and race to a more general crisis of existence. Toronto-born mezzo-soprano Lucia Cervoni, whose career has burgeoned in Europe, made her first Toronto appearance to enthusiastic acclaim. The clarity, depth and heft of her voice along with the fine acting skills that would make her an ideal Carmen also makes her ideal as the would-be Carmen that is Boesmans’ Julie. Cervoni skilfully exchanges the arrogant bright tones of the pre-liaison Julie for the duller, more anguished tones of her post-liaison self. As Jean, Clarence Frazer has a strong, soft-edged baritone. The role gives him little chance to show off either his range or power but it does require him to maintain a high level of intensity for the entire work which Frazer succeeded in achieving by colouring Jean’s responses with anger, cynicism, desire and finally pity. Some may complain that there is little chemistry between Cervoni and Frazer, but the concept of the libretto, reinforced by Jocelyn’s staging, is that Julie and Jean are each trapped in their own egos, not really lusting after another person as much as infatuated with the fact of transgression itself. Soprano Sharleen Joynt is a constant pleasure. Boesmans gives Christine the most grateful lines of the opera, from the folk song she sings to herself to the ascending melismas that contrast her with Julie and are linked to her naive piety. Joynt shows through Christine’s one coloratura outburst the strong emotions that the outwardly meek character otherwise suppresses. Conductor Leslie Dala draws exquisitely precise playing from the orchestral ensemble that relishes the tart sonorities of the score and its alternation of periods of growing tension and periods where that tension shatters into skittering fragments only to regather. Jocelyn’s direction is even more minutely detailed than one has seen in his plays since he shows himself always sensitive to both the words and the music. The production is filled with an abundance of inventive ideas. Part of the basic set is a cage holding three canaries – already an image of the confined lives of the three characters. After her liaison Julie dons Jean’s shirt and begins to wash the dishes as if in her first flush of ecstasy she has subsumed the role of both Jean and Christine. Later Julie in anger throws red wine on the Jean’s chest, just where the blood later spurts from Julie’s canary when Jean kills it, thus linking Julie with the superfluous bird. Jocelyn creates a fine image for Julie’s death with Jean holding the roller for an electric extension cord, into which he had earlier plugged his electric razor, that Julie uses to hang herself in silhouette. Yet, despite the way the image links Jean directly to Julie’s death, if her death is to be shown by shadows, then having her slit her throat as in the play would be much better since it would more powerfully link her to the bird Jean had so callously killed. 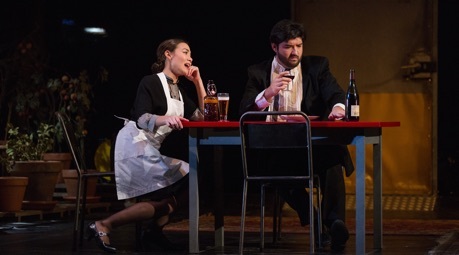 Canadian Stage’s first foray into opera deserves to be to be a success. If it is, Toronto may finally have the forum for modern chamber opera that it has lacked ever since 2009 when the COC ceased producing a separate opera for the COC Ensemble. Every opera drawn from an earlier source is an adaptation and the comparison of Boesmans’ Julie with Strindberg’s original provides insight into both. This experimental collaboration between Canadian Stage and Soundstreams makes me hunger for more such ventures. And the sinuous, expressive, always fascinating music of Julie makes me hunger for more Boesmans. Note: A version of this review will appear later in Opera News. Photos: (from top) Lucia Cervoni and Clarence Frazer; Sharleen Joynt and Clarence Frazer; Sharleen Joynt and Lucia Cervoni. ©2015 Cylla von Tiedemann.